Correlation and causation, closely related to confounding variables, is the incorrect assumption that because something correlates, there is a causal relationship. This example highlights another reason behind correlation and causation errors, because the Professor was strongly anti-smoking. He was hoping to find a link that would support his own agenda. This is not to say that his results were useless, because they showed that there is a root cause behind the problems of delinquency and the likelihood of smoking. 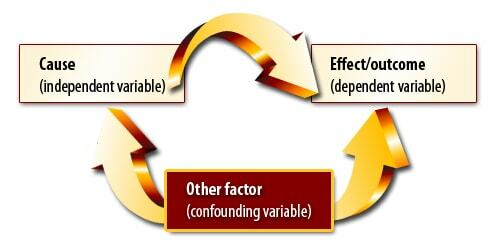 This, however, is not the same as a cause and effect relationship, and he allowed his emotions to cloud his judgment. Smoking is a very emotive subject, but academics must remain aloof and unbiased if internal validity is to remain intact. The principle of incorrectly linking correlation and causation is closely linked to post-hoc reasoning, where incorrect assumptions generate an incorrect link between two effects.